Honestly, this was fantastic! I just really loved everything about this delightful story. I know Julia Whelan from her work as a narrator so I was really curious about this book as soon as I saw it. 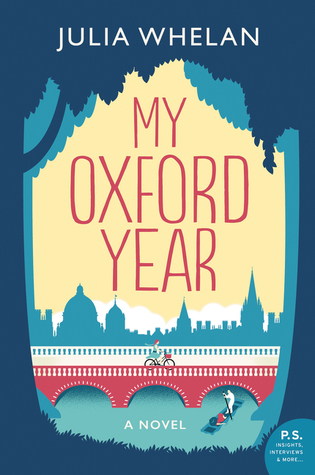 I decided to give it a try simply because of my curiosity and didn't really know much about the book beyond my guess that it would be about someone spending a year at Oxford (nothing gets past me). This book is really so much more than that and I must say that I had such a good time reading this book. Ella is at the center of this story. Ella is from Ohio and has just made it to England to study at Oxford on a Rhodes Scholarship. To make things even better, she gets a call offering her a position to work on a presidential campaign just as she makes it to England. Things are looking up for Ella. She soon realizes that things are a little different at Oxford than she expects but she is making friends. One of her classes is being taught by the same man she had a run-in with at the fish shop on her first day in town. I do think that this a book that will really be best to go in as blindly as possible so I am going to be careful not to include any spoilers in this reviews. I really liked Ella. She is so driven to do well with everything she attempts but it quickly becomes obvious that she will have to make a few adjustments to succeed at Oxford. She was just such a strong character and I found her very easy to relate to. I really liked her more and more as the book progressed and thought that she grew dramatically as a character. Jamie was also great. He was more of a mystery to me at the start of the book but as I continued reading, I really fell in love with him. He was such a great guy and I thought he compliments Ella very well. This story made me think, it made me feel, and it even made me laugh. This book was such a joy to read. When I started reading, I thought that this was going to be one kind of story and then things changed and by the end of the book I was reading something totally different. I loved the fact that this book went in such an unexpected direction kind of like life tends to do. I would highly recommend this book to others. Julia Whelan has proven that she is not only great narrator but that she is also a wonderful writer. I am so glad that I had the opportunity to read this story and can't wait to read more of her work in the future. Sweet! I have this book and look forward to reading it. Glad to see you enjoyed it so much. I hope you like it as much as I did, Christy! I hope you enjoy it if you get the chance to read it, Silvia! I am putting this on my wish-list. Thanks for sharing and great review! wow I love your enthousiasm for this one! I had such a good time with this book, Melliane! Glad you really enjoyed this one. Sounds like I might have to at least grab this one from the library. I was a little surprised by how much I liked this one, Barb! This is her first book and I really enjoyed it. I was wondering why her name seemed so familiar! I've listened to her narration many times and she is excellent. I wonder if she's going to narrate this one? I was curious about that myself and checked. She does narrate this book which would be a great way to experience the story. Glad to hear you enjoyed this one. I hadn't heard of it before now. I liked it so much more than I thought I would, Mary! Good surprises are the best! I am all about a book that delivers the feels. I have this one in my soon-to-read queue, so I am really happy to read such a positive review. I hope you like this one as much as I did, Sam! Glad you liked this one. I'm not a big fan of teacher-professor relationships, but it sounds like it could be fun for readers who like that dynamic. I am not usually a fan of that either. This was a little different since she was a Masters student and he was just teaching the one class. They are about the same age. Great review! I am curious about this one, and I really love books that take place in England. Ella sounds like a wonderful character too. I really did like Ella and the setting was a lot of fun as well. Sounds like a wonderful read, and so excited to read it! Thanks so much for the giveaway! It was a great book, Maria! Good luck! Thanks for the giveaway this is for sure on my TBR list! I knew I knew the name Julia Whelan from somewhere but I couldn't place it! As soon as you mentioned she was a narrator it clicked. This does look really wonderful and has been on my TBR since I saw it come out but now it's a bit higher up! I hope you get the chance to read this one, Katherine. I thought it was really well done. Sounds great! Looking forward to reading! I hope you enjoy it as much as I did, Jennifer! Ella sounds like a character I could really relate to. I am adding this one to my wish list! I really enjoyed this one, Wendy. I hope you do get the chance to read it soon.